Over 500 headstones were damaged at the weekend at the Jewish cemetery in Philadelphia. 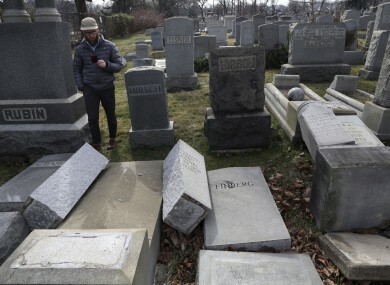 JEWISH CENTRES AND schools across the US coped with another wave of bomb threats earlier this week as officials in Philadelphia made plans to repair and restore hundreds of vandalised headstones at a Jewish cemetery. Jewish Community Centres and day schools in at least a dozen states received threats, according to the JCC Association of North America. No bombs were found. All 21 buildings — 13 community centers and eight schools — were cleared by Monday afternoon and had resumed normal operations, the association said. On Friday, a man was arrested on suspicion of being behind eight of the threats. “The Justice Department, Homeland Security, the FBI, and the White House, alongside Congress and local officials, must speak out — and speak out forcefully — against this scourge of anti-Semitism impacting communities across the country,” said David Posner, an official with JCC Association of North America. Hundreds of headstones, some of them more than 100 years old, were cut in half, local media reported Sunday. A local rabbi, who was unnamed, told ABC television affiliate WPVI that the affected graves at the historic Mount Carmel Jewish cemetery in Philadelphia’s northeastern Wissinoming neighborhood also included those of one-time members of the Quaker and Muslim communities. “We’re not interested in any narrative about victimisation and as heartbreaking as this is, we are strong together,” the rabbi said. New Jersey resident Aaron Mallin discovered the vandalism on Sunday when he came to visit his father’s grave at the cemetery. “It’s just very disheartening that such a thing would take place,” he told WPVI. Police say they are investigating the vandalism. The Anti-Defamation League has offered a $10,000 reward for information leading to the arrest and conviction of those responsible. The attack comes a week after more than 100 headstones were damaged at a Jewish cemetery in St Louis, Missouri. The incident prompted a Muslim-led crowdfunding campaign to raise more than $100,000 to repair the cemetery, and a visit by Vice President Mike Pence. Among more recent attacks, vandals spray-painted swastikas on several cars, highway overpasses, buildings and an elementary school playground over the weekend in Buffalo, New York, The Buffalo News reported. Email “Jewish communities in the US have faced a string of anti-semitic threats so far this year”. Feedback on “Jewish communities in the US have faced a string of anti-semitic threats so far this year”.